DVD Review: Wagner- A Genius in Exile – where are we now? 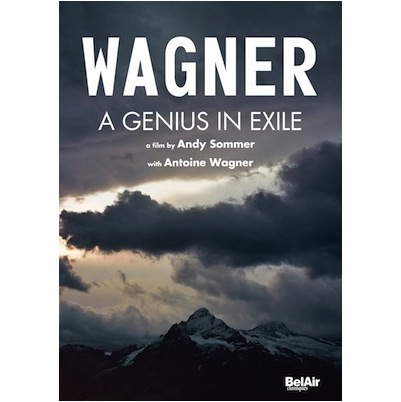 Wagner: A Genius in Exile is a documentary by Andy Sommer that features Richard Wagner’s great-great-great grandson, Antoine Wagner. Richard spent two stretches of his life in exile in Switzerland, and was known for his extensive hiking in the mountains there. Antoine travels to Switzerland to experience Richard exile for himself by hiking in the Swiss landscape and investigating how the landscapes influenced Wagner’s music. He supplements this primarily-visual work with interviews by scholars and musicians. Add to that Wagner’s operatic music as the soundtrack, and you have a compelling mix of elements for a documentary. You can’t help but watch this movie and try to draw the parallels between it and the idea of Gesamtkunstwerk, Wagner’s idea of merging all art forms into a contiguous, psychological whole like the Ring Cycle. Just like Wagner attempted to integrate music, poetry, drama, architecture, and myth into a grand art form that also tried to be about literally everything, this movie tries to be about a lot of things. It is somewhat a road trip movie about Antoine Wagner finding himself and connecting with his roots. It’s also an abridged biography of Richard Wagner and his music, focusing on his two extended stays in Switzerland. It’s also a making-of documentary about a photography exhibition by Antoine that we never see. It’s also basically a tourism promo for Switzerland. These various threads never integrate to the extent of a Wagner opera, but who says they have to? I had a hard time figuring out if I was supposed to be bonding with Antoine or just taking in the scenery and the facts about Richard’s life. After watching, I think you should stick to the latter. Antoine Wagner has enough charisma on screen when he’s riding around with his Super 8, or when he gleefully puts his sunglasses on a statue of Wagner’s head, but this charm doesn’t carry over to the interview sections, which are highly segmented, even in the bonus features that show full interviews with two of the scholars. His questions aren’t too penetrating, basically asking about Wagner and his contemporaries’ appearances, any good stories, and then the basic historical facts. I rolled my eyes a little when he asked the Music Director of the Opéra National de Paris how Wagner depicted love in his operas. The big question in a documentary like this is how they are going to integrate Wagner’s music into the work. So much of his music doesn’t resolve in easy ways, and it’s not really conducive to being cut up and excerpted in little snippets. Yet they make it work. Although I thought they kept returning to the megahits of Ride of the Valkyries and the opening of Tristan und Isolde too much, they were good about mixing it up a bit. They were good enough to show some scenes from some of the operas with very different stagings, which was really nice to see. Some of the most compelling moments of the movie were when the scenery and the music linked up explicitly. We have primary sources of Wagner saying that he got certain ideas for themes in certain places, and this movie was good about lining them up and pulling some great one-two’s of scenery and music. What’s unfortunate about this movie is that Wagner himself was just such a huge jerk. Every anecdote, every tidbit, though sometimes fascinating, just solidifies what we already know. His infidelities, his misogyny, his whack-job views about just about everything in the world, and of course his anti-Semitism come to the fore at some point. The discussion of his anti-Semitism is very short, but they make sure to drive home that Wagner was racist in a much deeper way than your typical 1800s European Jew-hatred. But in the same way that you don’t go out of your way to listen to past composers’ music because you heard he used to be really nice, you can’t ignore Wagner’s legacy just because he was a jerk. His music is truly amazing, and you have no choice but to grapple with it in some way. Wagner’s exile in Switzerland removed many of his distractions and helped him consolidate his own theories about how to construct his epic Der ring des Nibelungen. He wrote some of his greatest music while under the influence of the landscape and people of Switzerland, and it truly shows in this movie. You don’t need to know anything about Wagner’s work to enjoy this movie, and even those who do will inevitably leave enriched.